The Institute for Oral History has been gathering the memories and stories of people who lived and worked in Waco and McLennan County since 1970. The Institute records interviews, transcribes the recordings, and places the recordings and transcripts in the archives of Baylor's Texas Collection for researchers to access. Some Wacoans whose memories have been recorded and archived are pictured to the left. 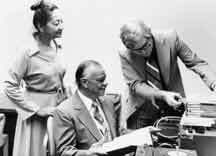 On top left, Waco 's first black mayor, Mr. Oscar Norbert DuConge, and his wife receive copies of the tapes and transcripts from eleven interviews with Mr. DuConge from Dr. Tom Charlton, founding director of the Institute. 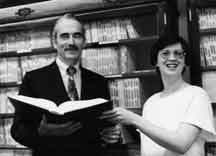 In the center, Mr. Roger Conger, Waco businessman and historian, whose family pioneered in Central Texas, looks over the volume of transcripts of his six interviews recorded in 1975-1977. 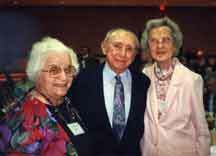 Pictured third are three members of the Waco High School Class of 1918, all of whom have shared their memories of growing up in Waco before World War I and of attending high school during the war. Shown are Mary Kemendo Sendón, Hannibal “Joe” Jaworski, and Gladys Jenkins Casimir. To learn more about the Institute's mission, history, projects, news, and publications, visit its Web pages at http://www.baylor.edu/oral_history. The Institute also welcomes you to take advantage of its Workshop on the Web for both beginning and advanced oral history training. Find the workshop at http://www.baylor.edu/Oral_History/index.php?id=23560. A fully searchable guide to its collection of interviews with Waco and McLennan County folks is available at http://www.baylor.edu/Oral_History/index.php?id=23568 . The Institute staff stand ready to consult on oral history matters with all participants in the Waco History Project.